Tunisian Preserved Lemons for sale. Buy online at Zingerman's Mail Order. Gourmet Gifts. Food Gifts. I’ve always liked the idea of preserved lemons. But I get stumped at the same place you probably do: what do you do with them? You can research recipes and get an idea, but I wasn’t truly inspired until I ran into a friend who lived in North Africa. “Oh! Preserved lemons! Can I have your jar? I love them in everything!” Everything? Simple enough place to start. I started trying what she suggested, adding them everywhere. 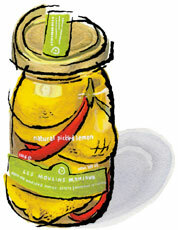 Simply cut off a slice or two (return the rest of the lemon to the brine), dice and mix into your favorite sauces. Toss with salads. Garnish grilled meat. Slip a slice or two into a tuna fish sandwich. Add a slice to a martini. Slip a few slices of preserved lemon into a whole fish before baking, then put a couple more slices on top before serving. One lemon can go a long way, flavoring up to a dozen dishes. Grown and preserved on the wonderful Mahjoub farm in Tunisia, where we also get couscous and harissa, which, paired with preserved lemon, is a classic flavor combination. Opened, they last months in the refrigerator.